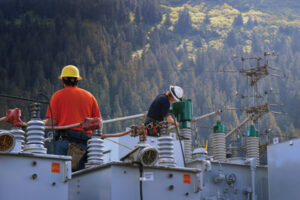 Headquartered in Juneau, Alaska Electric Light and Power Company (AEL&P) provides retail electric service for approximately 16,768 customers. 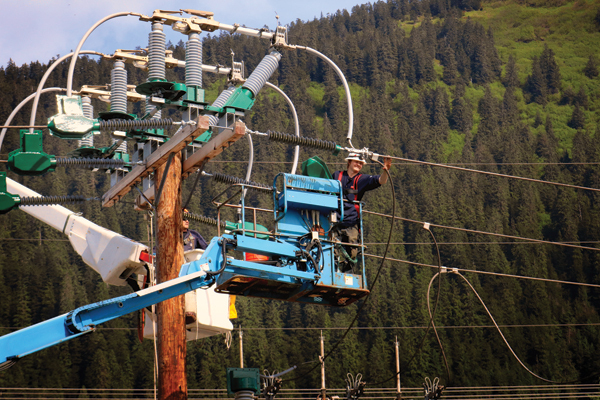 The Lemon Creek substation is a key site for AEL&P in supplying backup power and electrical distribution to the city of Juneau. It is located near a landfill, a food source attractant to many species of avians. AEL&P had been proactively investigating and testing several avian protection options available in the marketplace. These efforts helped, but there was still a need for further improvement. Following a significant eagle-caused outage that was reported on by the media, the Greenjacket Team reached out to AEL&P to offer assistance in solving these issues. 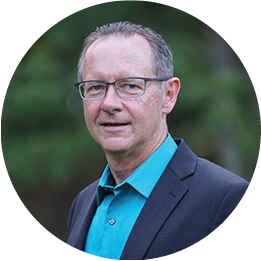 AEL&P recognized the Greenjacket solution was unique and best able to address the unique challenges they faced. At times, literally hundreds of bald eagles congregate in the area and are very active in the substation as well. Eagles are some of the largest avians with wing spanning over 6-feet across, potentially resulting in contact with wider electrical component spacing associated with high voltage equipment. Eagle excrement can cause flash overs. These “streamers” can be up to 6 feet long. Total customers interrupted about 9,714 or about 58% of system. 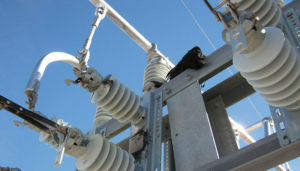 The Lemon Creek site has several generation tie transformers, distribution transformers, voltage regulators, disconnect switches, buss, jumpers, lightning arrestors, PTs, vertical orientated transmission switches, and steel poles that have unique configurations. Only the made-to-order Greenjacket product could properly protect these unique configurations. This project brought several challenges to the Greenjacket team besides the high concentration of bald eagles. The precise-fit, custom engineered equipment covers are a unique solution. To install the covers, AEL&P had to isolate part of the transmission and distribution system, which required running costlier diesel backup than the normal 100-percent hydro-power generation. Timely and efficient installation was important. The Greenjacket team provided online installation video instructions, well organized packaging, detailed assembly instructions, and field service assistance. AEL&P was very satisfied with the precision and success of the timely install, providing lower costs to its customers. According to Mr. Eriksen, “The frequency of incidents averaged one per year. So, if a year goes by without incident, the initial assumption is that it will be a successful project, and our customers will appreciate the added electric service reliability and also protection for the avians.” He added, “It was also a pleasant surprise to receive several positive comments from people enjoying the vibrant ‘green’ color of the covers, compared to the typical dull grey of utility equipment”.